Starwood’s Four Points brand has again summer promotion in conjunction with Coca Cola. The offer is valid for stays between May 18 and September 7, 2015. 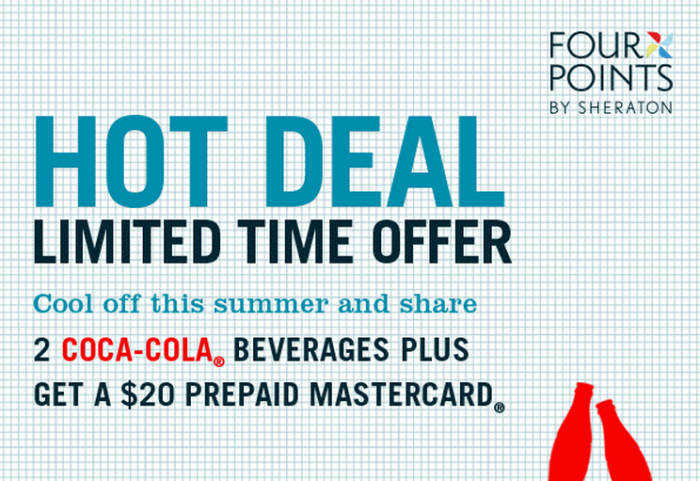 You can get two Coca Cola products and $20 prepaid MasterCard giftcard. Note that the giftcard will be mailed to the member’s address four weeks after the completed stay. Members in the US receive the card in USD, Canadian members in CAD, and all other members in USD. Note that there is a 2% currency conversion fee if used outside of USD/CAD. The offer requires minimum of 2 nights stay and arrival on Sunday, Monday, Tuesday, Wednesday or Thursday. This can be a good offer as long as the hotel has loaded reasonable rates under this promotion. Remember to check them all. Offer is valid at participating Four Points by Sheraton hotels and resorts in the US, Canada and Latin America. Offer is valid for stays booked and completed between May 18, 2015 and September 7, 2015. There is a 2 night length of stay minimum on this promotion. Guests must arrive on a Sunday, Monday, Tuesday, Wednesday or Thursday. Book online today, visit fourpoints.com/coke. All package amenities associated with this promotion are per room, per eligible stay and include one (1) $20 Four Points Prepaid MasterCard and (2) 20 oz. Coca-Cola beverages. If 20 oz. Coca-Cola beverages are unavailable, 16 OZ. cans will be used. A maximum of one (1) $20 Four Points Prepaid MasterCard® will be awarded per reservation booked and completed during the promotional period regardless of how many people are staying under the same reservation. Guests residing in the US will receive the prepaid cards in US Dollars. Guests residing in Canada will receive prepaid cards in Canadian Dollars. Guests residing in Latin America will receive cards in US Dollars which can be transferred to local currency at a 2% currency conversion fee. (1) $20 Four Points Prepaid MasterCard® will be mailed to the guests’ address of record within 4 weeks of the completed stay. This promotion is sponsored by Starwood Hotels & Resorts Worldwide, Inc. (Starwood). ©2014 The Coca-Cola Company®. “Coca-Cola” is a registered trademark of The Coca-Cola Company®. MasterCard International Incorporated is not the sponsor of this promotion and shall have no liability in connection with this promotion. Prepaid cards issued by MetaBank® (US), Member FDIC, or Peoples Trust Company (Canada) pursuant to license by MasterCard International Incorporated. Card terms and expiration apply. Prepaid card is given to you as a reward and no money has been paid by you for the card. No cash access or recurring payments. Card valid for up to 12 months; unused funds will be forfeited at midnight EST the last day of the month of the valid thru date. Card terms and conditions apply. In the US prepaid card is issued by by MetaBank®, Member FDIC; in Canada card is issued by Peoples Trust Company; pursuant to a license by MasterCard International. MasterCard and the MasterCard Brand Mark are registered trademarks of MasterCard International Incorporated. Card terms and conditions apply, see MyPrepaidCenter.com/site/mastercard-promo (US) or MyPrepaidCenter.com/site/mastercard-univ-can (Canada).